The Walking Dead is been the most popular Television series in last Two years. Are You a Fan of “ The Walking Dead”? If yes, then you should dress up like a zombie this year. It seems everyone is into zombies this year as zombies have risen to the top of Halloween costume list. Outfit depicting “The Walking Dead” are among the most favorite Trick or Treat apparels. Zombies came in fashion last year and will remain. Zombies are people came back from the dead. It’s too early to tell what’s going to be a big seller for kids , although Power Rangers are selling as well. The hot trend from past year, Angry Birds seems to be cooling down. So zombies make the best Halloween costume. Creepy, gory and frightening they are the perfect Halloween costume. If you are looking for cool zombie costume or the walking dead costumes then you have came to the right place. We have the collection of the coolest zombie costume for Halloween. This is latex mask that fits on most of the adults. Its easy to attach this mask. It fits on your head easily. All you need to do is apply some latex liquid to your chin. As an added touch you can also apply some fake blood. This Walking Dead Zombie Mask is really gross. That means this is just perfect for Halloween night. 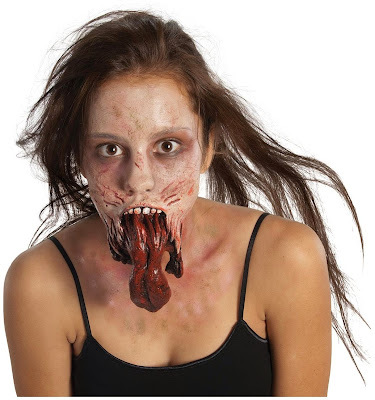 This horrifying zombie costume is about as realistic as it gets. The Walking Dead-Deluxe Decomposed Zombie Costume is an officially licensed costume from The Walking Dead team. The costume features the creepy mask with the part of skull missing and the brain exposed with tattered and torn blue shirt attached with the chest plate mask. The chest plate mask features the cuts, bloody open wounds and organs underneath. This nightmarish costume will definitely be the talk of party on Halloween. The terrifying Walking Dead-Pajama Zombie Costume the famous little girl is the officially licensed costume from The walking Dead products. We have the mask and the costume as well. This is a good quality mask, fits great and look awesome. The costume comes with all the fixings you just have to add the teady bear to it. Robe comes with the attached shirt and you also get shorts and slippers. This costume comes for kids, teens and adults as well. Mask includes latex appliance, latex adhesive and blood packet. Add blood to make costume more creepy. The smokey eyes and the torn away face just screams zombies and makes you want to scream. Zombie Split Head Mask takes the fright factor to a new level. This mask features cuts and open bloody wounds which are very creepy and a good quality mask which looks great. The flashy bloody wounds gives a terrifying and ghoulish look which no one can forget. You just have to add some makeup around the eyes to make it look realistic. 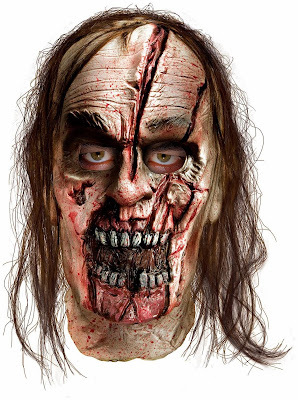 The Walking Dead- Zombie with Split Head Mask is an adult mask and officially licensed from The Walking Dead products. Rick Grimes costume is one of the most wanted walking dead costumes. This costume comes for kids, teens, and adults as well. Be the sheriff Rick Grimes and discover a post-apocalyptic world overrun with zombies. Rick Grimes has been describesn as an everyman character who emphasizes moral codes and values. This costume features some open wounds on arms and just a pale makeup on face. So its easy and most of people want to be one like Rick Grimes. So dress up like your favourite survivor Rick Grimes.